Throughout the year, Burson-Marsteller encourages all its offices to give back to their communities, especially during the holiday season. Throughout the year, Burson-Marsteller encourages all its offices to give back to their communities, especially during the holiday season. For the holidays this year, some offices are partnering with local charities to help with donation drives. 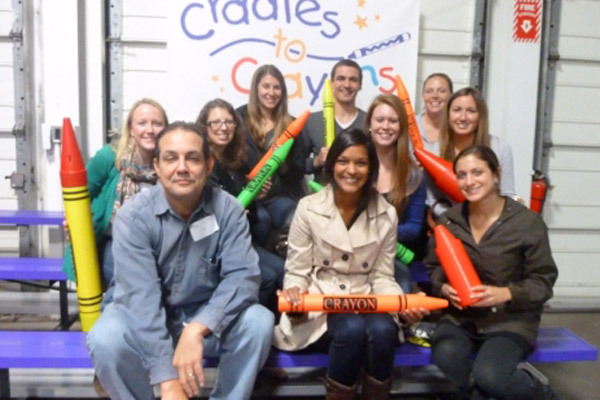 For the past two years, the Burson-Marsteller Boston office has volunteered at a local charity, Cradles to Crayons, which provides essential items such as clothes, shoes, books, and school supplies to homeless and low-income children through its “Giving Factory.” Burson-Marsteller Boston was drawn to this charity due to its vision that “one day every child will have the essentials they need.” The team hopes to make this promise a reality by volunteering every few months at the Cradles to Crayons clothing warehouse, where they inspect, sort, and package new and like-new donations into customized “KidPacks.” This December, the Boston team is continuing their relationship with Cradles to Crayons by holding a clothing drive during their holiday party to donate to the Giving Factory. The Burson-Marsteller Washington, DC office will once again partner with local DC-based charity SOME (So Others Might Eat) in their annual Shoebox Gift Drive. These shoebox gifts provide essential toiletry items to Washington, DC's less fortunate and give Burson-Marsteller the opportunity to give back to its community. SOME has served Washington, DC for 40 years, working to feed and clothe the city's homeless and poor, treat ill homeless people with medical, dental, and mental health programs, train people for jobs, and house homeless families and single adults. Over the years, SOME has helped thousands of people get off the streets, transform their lives, and live independently.